With emphasis on harmony, comfort, and privacy, Pousada Quintal do Mar offers you a warm ambience of incredible beauty, extraordinary taste and a certain sofistication. Only 30 steps away from the sand, each of the four seductive guest rooms is named after one native fruit or flower and decorated accordingly. We invite you to benefit from the splendid wellness this place evokes . 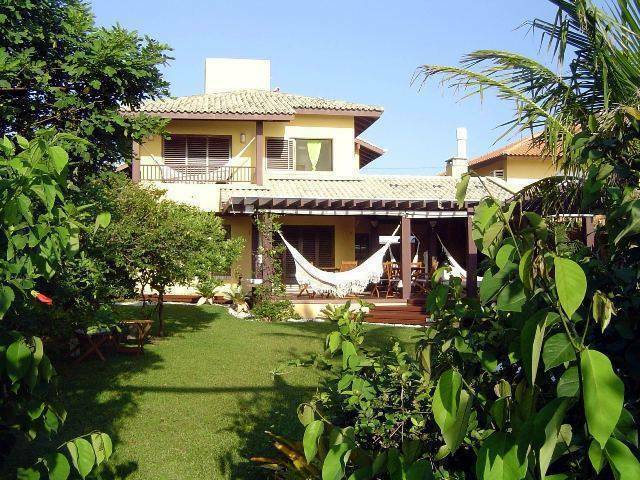 Quintal do Mar is surrounded by a gorgeous garden where you can find many exotic fruit trees and flowers. How about relaxing in the irresistebles hammocks on the deck and listening to the sea sound. You will always have a cosy spot to experience the rare luxury of total freedom, like a ocean front suspended deck over the native vegetation, a kioski hidden by the trees, and many others. Every space of the house is comfortable and elegant, perfect for you to relax and enjoy. A fireplace and a DVD player is availble in the Livingroom as well as a selection of music, shows and movies. Every room is uniquely decorated and has air conditioned, tv (connected to the main dvd and a selection of shows and movies ), minibar and cd player. Each room has one comfortable queen size bed wich is equipped with 200 thread egyptian cotton sheets and feather pillows. Double Room Flor de Maracujá: beach front with balcony, main decoration color: mauve / Double Room Aroeira da Praia: beach front, main decoration color: green / Double Room Araçá da Terra: side of the guesthouse with balcony, main decoration color: yellow and orange / Double Room Doce Pitanga: side of the guesthouse, main decoration color: red. All rooms have ocean view, with ensuite showers and toilets. Mariscal Beach astonishes with its natural beauty. The crystal waters and white sand are surrounded by green hills of exuberant nature. Particular care was taken to ensure that the native vegetation wasn´t touched. 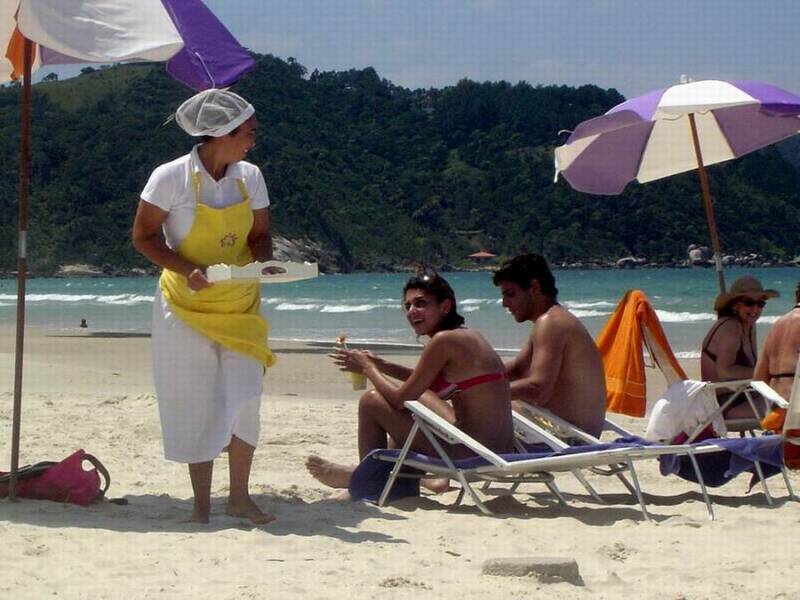 At the same peninsula you can go to many others beautiful beaches at a maximum distance of 8 kms. 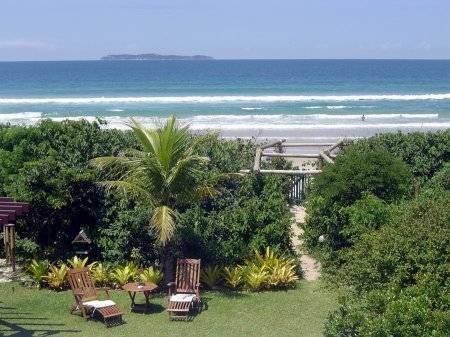 Mariscal Beach is located in the South of Brazil on the coast of the state of Santa Catarina (SC). This coast is also known as The Emerald Coast. The name of the town is Bombinhas famous for its ecological scuba diving and the Marine Biological Reserve of Arvoredo Island . Take a van or a taxi from airport. It´s better to make a prior reservation. We can help you with that.